Let your off-topic run wild. All are welcome and of course so is friendly derby discussion. [i]There’s a lot of work to be done this week on, you know, on these– all these architectural type cakes. And, the week won’t be that bad if I kind of pace myself well. I do like to sit down and just kind of think about the day. /i In the sporting world they call it visualizing. It could also be called procrastinating. *There’s a lot of work to be done this week on, you know, on these– all these architectural type cakes. And, the week won’t be that bad if I kind of pace myself well. I do like to sit down and just kind of think about the day. *(Richard laughs) In the sporting world they call it visualizing. It could also be called procrastinating. WHICH nation’s coins feature caribou, beavers, loons, and polar bears? WHAT country is among the world’s top five producers of natural gas, copper, zinc, nickel, aluminum, and gold? WHERE do people put gravy and cheese on their French fries? And finally, WHAT North American country can now order from Shirt.Woot? If you read the theme title above, you know it’s Canada! 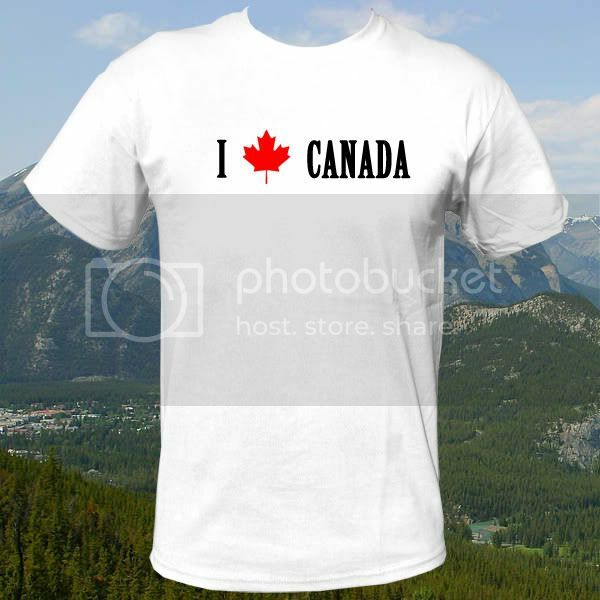 Yankees, welcome our Northern pals to Shirt.Woot with a Canada-themed shirt design. Canucks, tell us a little something about your home and native land, in t-shirt form. (Given the sorry state of our public schools, that’s how we learn most things down here in the States.) And voters, try to look past the tired old Canadian stereotypes. From Thunder Bay to Medicine Hat…from universal health care to English/French bilingualism…from politeness to courtesy…it’s Canada! Take off hoser! Oh I am so going to watch this movie tonight now. I’m definitely doing a beaver mountie. It’s based on a stuffed animal I got when I went on a girl scout trip in Dorchester. That’s hopefully going to turn out super cute. I can’t wait to see it. They put gravy and cheese on their fries? That’s kinda vile…and yet I also want to try it. Nyaaa! I wonder how much of this we’re going to see. Yeah I’m surprised they didn’t put a “no maple leaf” restriction on this one. Since it took me 5 minutes to put that together I’m seriously considering submitting it to see Adder’s reaction, lol. PS - Does it already exist? I’d be very surprised if it didn’t already exist. I thought you pulled it from somewhere else, actually. It’s been a few derbies since text was allowed. Yeah that’s what I figured…but I can’t find one. This is as close as I can find. Yeah that’s what I figured…but I can’t find one. Aha, I looked for the wrong thing, hee hee. Which is also why I asked. It had to have been done.